Forty years ago I hitchhiked up to a farm west of Lusaka in Zambia. Three months later I left as a born again Christian. The farmers/missionaries introduced me to Christ in their home Bible studies and I made a profession of faith after hearing an evangelist at their Baptist church. In retrospect, it’s probably best that I did not know the whole story of the family on the farm. It turned out that the man of the house had abused several people in his care. As for the evangelist, I don’t remember anything about him, except that he came from Perth, Australia. He may have been an absolute saint – or not. Maybe I should have waited to get saved under more carefully controlled circumstances – like the Billy Graham Crusade which came to Vancouver in 1984. But the fact is that nobody would likely have invited me. At least, no one had really shared the gospel with me during my first 25 years of life. So, I remain thankful to the flawed family – including the father – who introduced me to the gospel. And I thank the local Christian leaders who are supporting the Festival of Hope in Vancouver. I am prepared to welcome Franklin Graham to town next March, despite the fact that I see some pretty serious flaws in some of what he says, and have little doubt that other Vancouverites will see them as well. As members and fellow leaders of the Christian community in Vancouver . . . we are compelled to formally respond to the request for endorsement by the Billy Graham Association and must unreservedly oppose the invitation of Reverend Franklin Graham . . .
Like the great majority of Canadians – including Christians, who have led the way in welcoming Syrian and other refugees – I don’t agree with his stand at all. 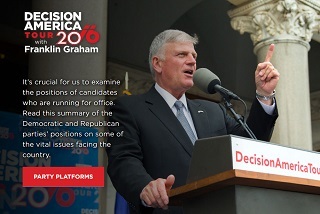 Graham takes pains to state that he does not promote either Trump or Clinton, though a look at Two Visions, Two Americas (in the BGEA’s Decision magazine) or the Party Platforms overview on the website suggests he fears Clinton more than Trump. A 2012 article in Christianity Today – founded by Billy Graham and still very much a sympathetic publication – asked Has Billy Graham suddenly turned political? The three commentators had a range of views, but the magazine was clearly concerned that Franklin was moving his father and the BGEA too far into the political realm. Here are some things to take into account as we consider the upcoming Festival of Hope. Festival of Hope executive leader Giulio Gabeli (pastor of Westwood Community Church in Coquitlam) and Festival director David Ingram (who works at the Billy Graham Evangelistic Association of Canada (BGEA) headquarters in Calgary) told me they respect the critics’ opinions, but said the Vancouver leadership team confirmed during an August 25 meeting that they will go ahead with Franklin Graham. Festival of Hope leaders gathered on the stage at Broadway Church March 31. Photo by Frank King. It is worth noting, as well, that three of the five who signed the letter had people at the Festival of Hope launch in March. A representative of City in Focus was there, as was Marjeta Bobnar, on behalf of the Catholic Church. While the opposition statement was signed by Catholic ecumenical relations official Bobnar, Paul Schratz confirmed the archdiocese also formally declined an invitation to take part in the Festival of Hope. “Initially we were supportive of next year’s event, since it was intended to draw a large number of people to hear the gospel and grow closer to Jesus,” said Schratz, spokesman for the archdiocese, which includes more than 400,000 Catholics. The intent of the private memo was to ask the committee to consider a less polarizing speaker and ideally a Canadian like Leighton Ford or Ravi Zacharias who is part of the Graham Associate orbit. We support Samaritan’s Purse and I wish Franklin the very best and I have no negative comment regarding him or his ministry. The Festival has been common knowledge for a couple of years in Vancouver; a local team went to the Toronto Festival of Hope in 2014 They were impressed by what they saw there, and shared their experience widely. While critique of the Festival is certainly legitimate, any attempt to suggest alternative speakers should have been made earlier than this summer. 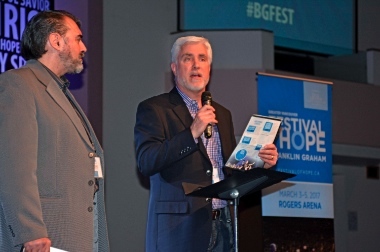 Festival of Hope executive leader Giulio Gabeli (left) with David Ingram, BGEA’s Festival director. Photo by Frank King. David Ingram noted that there are already at least 200 churches on board and that the large networks of Chinese and Korean churches (each more than 100 strong) are interested in joining. He expects at least 400 churches to be involved by the end of the year. Some of the large, often ethnically mixed evangelical congregations in Metro Vancouver that are endorsing Graham’s crusade include Willingdon Church, Westside Church, Coastal Church, Broadway Church, Glad Tidings Church, Holy Trinity [Anglican] Church and Richmond Pentecostal Church. Graham “is not coming to Vancouver to preach against homosexuality, but to preach the gospel,” Wong said. 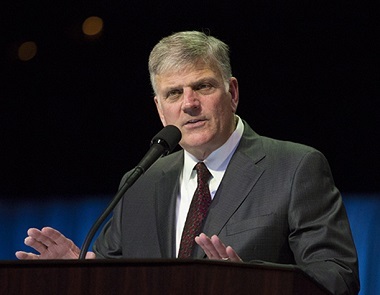 The Billy Graham team points out that Franklin Graham is only part of the year-long Festival of Hope process.Following the launch event, which drew about 1,000 people to Broadway Church March 31, there were a series of Involvement Seminars at 12 churches from May 2 – 10. This fall, a Pastors Breakfast at Willingdon Church September 17 will offer adult evangelism training; 24 churches from a wide variety of denominational backgrounds will host Christian Life and Witness Courses from October 4 – 22; and FM419 Student Evangelism Training will be held at Broadway Church October 15. Many Vancouverites can point back to Billy Graham’s visit in 1984 as a turning point in their faith journey. We still need all the help we can get with evangelism – and the BGEA has the experience and the know-how to pull together a large-scale evangelistic event. Some will say the Festival approach is outdated or too narrow. The Toronto experience suggests the former is not true – many were saved, many were renewed in their faith and hundreds of churches worked together for the good of the city. Is the evangelistic focus too narrow? No. Ingram and BGEA are the first to acknowledge that the Festival has a simple goal: “bringing the Good News of Jesus Christ to Vancouver.” When people go forward to commit themselves to Christ, or to renew their commitments, they will be directed to local churches for discipleship. The Festival of Hope is far from the only model of evangelism. We are fortunate to be an active centre for the Alpha Course, which is gearing up for a major initiative this fall (supported by many of the same churches which support the Festival). There are other initiatives, but they’re pretty rare. We can learn something from Graham – boldness, directness, willingness to confront . . . but mainly the simple gospel message of salvation, which does not require any degree of human perfection to pierce the heart. The Festival will also not cover all elements of the Christian life. Should our faith be more justice oriented? Yes. More sophisticated intellectually? Yes. More community oriented? Yes. Franklin Graham is not being invited to address those needs. They are down to us. Though the church of Vancouver has lots of room for growth in all of these areas, I think we already have something to share with Franklin Graham when he comes to town. The first and most important distinction to make about evangelicals is to highlight the difference between evangelicals and the Religious Right, the latter being the source of most of racy news stories mentioned. While it’s fair to say most members of North America’s Religious Right are evangelicals (and, to a lesser extent, Roman Catholics), it is not accurate to assume that most evangelicals belong to the Religious Right. The second crucial thing to keep in mind is that Canadian evangelicals are often less fundamentalist and militant than their often-bombastic American counterparts. Some local Christians – and I would say particularly those born in America who have left behind that more assertive approach – fear that our (more open-minded? more polite? tamer?) brand of faith will be overwhelmed from the south. We also fear, I think, that Vancouverites will lump us in with those American believers, will judge us and might even ostracize us. 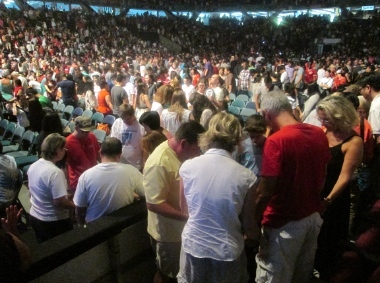 The Pacific Coliseum became a house of prayer during Voices Together last summer – and will again next July 1; Christians from all denominations are involved. Perspective is crucial. 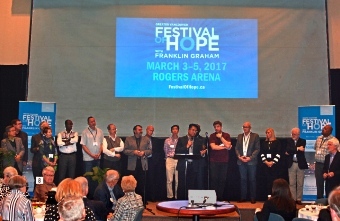 There is a long history of cooperation between leaders of Festival of Hope and the critics – More Than Gold, BC Leadership Prayer Breakfast (both led by Tom Cooper), Voices Together, the Catholic-Evangelical Conversation (part of the Vancouver Consultation, along with a series of focus groups around the city), etc. This fall, most will be involved in Alpha Team Training and the City Summit. Next year, there will be Missions Fest, a large 24/7 Prayer gathering and Voices Together on Canada Day . . .
We all must follow our own conscience. No one is obliged to support the Festival of Hope – but it is essential to remember that there is just one church in Vancouver; the community will be watching as we work out our disagreements. I respect all these leaders – those who are working hard on the Festival of Hope and those who feel they cannot. I have dealt with many of them, and I believe their motives are good. They have worked together before and they continue to work together. So in essence, Franklin is a hateful bigot who supports right wing extremists like Palin and Trump, but that’s okay because he’s just here to preach the Gospel? This is the argument? This is not good enough. Perhaps this is more a case of Evangelical leaders in town afraid of offending local right wing fundamentalists who are more important to them ultimately, than the unchurched Graham had no hope of reaching. Franklin Graham is no Christian. He follows the egotistical teachings of Ayn Rand at an $880,000 annual salary. He does not belong in Canada. We do not share his hate. Stay home. We don’t need his Alt-Christian evangelical efforts here. I know very little about Franklin Graham’s theology but especially today in the face of such blatant political and religious corruption, I commend church leaders who bold enough to wake up the church and get them engaged and not take their freedoms for granted. I can only pray and trust that he is discerning the voice of the Spirit and is obedient to that call. To sum up Bonhoeffer’s life: Being a Christian is less about cautiously avoiding sin but courageously and actively doing God’s will. There is broad support (and historical precedent) for churches in the Vancouver area to work together, “reaching people of all ages for Christ,” but choosing a polarizing figure like Franklin Graham to lead this event is a strange choice. I sent my concerns to Festival director David Ingram in February, but apparently the BGEA thinks that it makes sense for an American right wing political activist to represent the church in Vancouver. It is evident that a lot of thought and hard work as gone into writing this article. It is well written with a desire to foster unity and respectful cooperation among local churches. So needed in our times when people quickly react impulsively and often with little information. Thank you Flyn, for helping us think better, respond with care and trust that God is working in the midst of our broken world and through broken people. The church has rolled over and not stood up for what they believe too many times, way too many times. My hope and prayer is that we are getting stronger – part of being stronger is speaking up about messages that are not what we believe. Saying No . . . it’s actually not okay to promote fear and injustice and speak against love and equity. “Christianity” in the States right now is showing the world some pretty ugly faces. Why would we bring someone to Canada like that, when there are many fabulous speakers who promote a spirit of love, compassion and acceptance? Maybe he needs the feedback from from us that what he is saying is not okay – by inviting him you are saying in some way that you agree, or are okay with it. Tolerance, acceptance and inclusiveness all in the name of political correctness which flies in the face of Scriptures is the fall of this country. A lot of “Christians” are more concerned over standings and acceptance from the world than to proclaim and declare the truth . . . there are times for soft approach to ministry and there’s time for unity. The secular “progressives” have cornered the church to exactly where they want them . . . in the corner . . . silent and not to rock the boat. Flyn, what a great article. In no way will we all agree on everything, but to see something accomplished for God’s Kingdom, we have to subject out minor differences for the greater purpose to get people mobilized for sharing the Gospel, and seeing people come to Christ. Someone once disagree with Billy Graham and his methods, he asked him what his method was, he had no answer, so he said, “I like my method better than yours.” George Verwer, the founder of OM, would say that God works through messy situations and through messy people. Let us not hinder God’s work, but rather pray and trust God for His great work in Vancouver. Pastor Bert Kamphuis, pastor of evangelism at Fraser Lands, and consultant with International Student Ministries Canada. This article amounts to far too many empty words, the essence of which is criticism of a brother in Christ whom God has obviously raised up as a leader in His church. Much that has been written herein is irrelevant to the main focus of the article. I doubt that many of Franklin Graham’s critics are truly born again believers, but rather those of the Pharisaical variety. Anyone who fails to understand the difference between pointing out the evil of a perverted lifestyle and hatred of those that practice it is encumbered by the veil of blindness spoken of in Scripture. There are Jesus followers that DO care about having Franklin Graham speak in Vancouver, are in disagreement with his mixing of politics with evangelicalism and his hate inducing comments. There are churches and Christian individuals that are committed followers of Jesus or “born again” that will be distancing themselves from this event but we are in unity that there is good news in Jesus inclusive message of love to the world.